There aren’t many new pubs opening in Hackney these days, so the prospect of trying out The Naturalist, the latest addition to the Manor House food and drink scene, was an exciting one. Part of the Youngs chain, it is clearly aimed at the young professionals living in the new-build developments at Woodberry Down and indeed, when we arrive on a Thursday evening for dinner, the few other people in there are enjoying some after-work drinks. We’re told we can choose where to sit as the pub is pretty empty. Scanning around for the best table I can’t help feeling confused by the interior – someone has clearly spent a lot of money but the effect is a bit bemusing with often garish furniture clashing with some sort of science and nature theme. It definitely has that unmistakable newly-opened feel to it, not yet settled in its character. Still, it sits on the banks of a reservoir and has an extensive outdoor area which may be difficult to appreciate on a cold November evening but will surely be a pull in the summer. The menu tells us this will be an upmarket take on pub food, with seasonal fresh ingredients promised and prices to match. 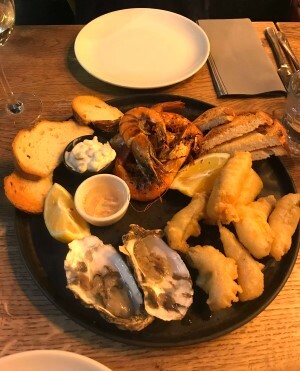 The sharing starter, a seafood platter, very much meets this brief: the prawns and oysters are good quality and the ale-battered cod strips are incredibly moreish; there is way too much bread but that’s only if I were being picky. Unfortunately, it all starts to go downhill from there. Despite being one of the only tables eating, the service is painfully slow. 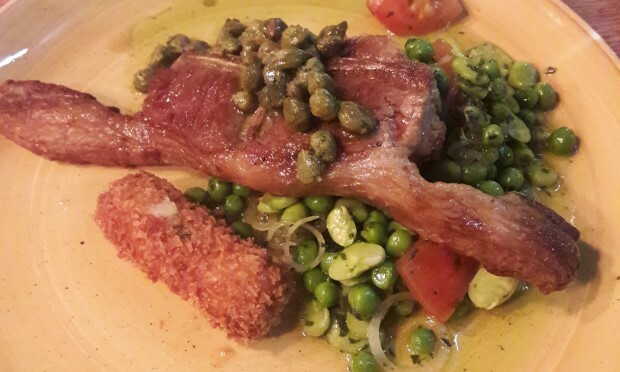 When the mains eventually do arrive though, my lamb Barnsley chop with caper and herb dressing is succulent and packed with flavour. I’m a little bit miffed to only get one for £15 but maybe that’s because I’m Northern. The accompaniments are more disappointing. There is a tasty potato croquette (again, singular) but the plate is dominated by a pea and bean salad which, while tasting nice enough, completely overwhelms everything else. My vegetarian friend was worse off. 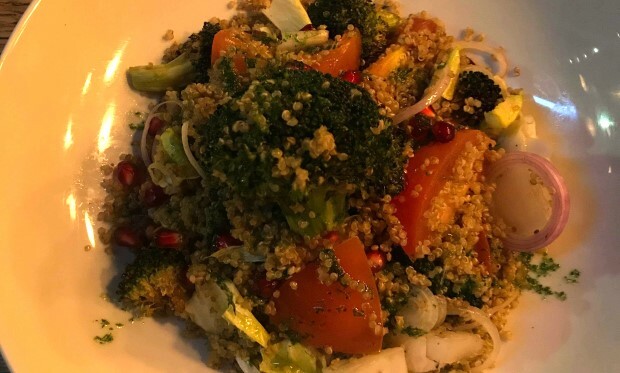 The one veggie option – a bold move in itself in Hackney – was a rather predictable and bland quinoa, squash and broccoli salad. Diplomatically, she described the dressing as “either very subtle or forgotten”. Needless to say neither of us are blown away and this was only aggravated by the slowness of the service. By the time we asked for the dessert menu we had been there for over two hours, and after waiting for 20 minutes with no sign of it, we decided to leave. When you find yourself saying things like “the toilets are nice” you know the experience hasn’t been great. Sadly, The Naturalist seems to be a case in point as to why so few new pubs are opening up in Hackney – it is a tough market with so many competitors and it is hard to offer something new. Perhaps it would be easier to forgive if it were a little cheaper, but I wouldn’t travel here for dinner. For those living in nearby flats however – and, after all, they are the ones being targeted – I’d probably be reasonably satisfied with a meal here if service improves, I wasn’t vegetarian and didn’t mind forking out a bit more for convenience.